Functions of a complex variable can be integrated like functions of a real variable. In the complex case however, the independent variable can vary in two dimensions (real and imaginary). 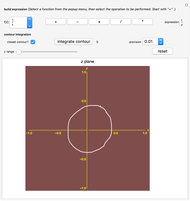 As a result, integration is defined over a contour or over a region rather than just a line segment in one dimension. You can build up a function, draw a contour on the graph, and then integrate it over the contour. Did it yield what you expected? Ryan Keelty Smith "Contour Integration"